Hundreds of different types of cells make up the trillions of cells in your dog’s body. And they’re very clever. Each type knows what job they have to do, how to do it, and when to do it. Cells know when to divide and make new copies of themselves, and when not to divide. A cell also knows to stay in their area or bit of the body and not to stray to other locations where they don’t belong. And importantly, cells know when they should call it a day and ‘self-destruct’ because they’re either too old, or they’ve become damaged. But how do cells know how and when to do their job? To put it simply, they have a genetic ‘instruction manual’ that comes in the form of deoxyribonucleic acid – better known as DNA. DNA is what makes our dogs who they are. It contains the instructions that determine what breed a dog is, how tall it will be and the colour of its coat. It tells cells if they should be an eye cell or a red blood cell. And it tells them how to do their job properly and when to do it. So it’s not surprising that if anything changes in a cell’s DNA – if any mistakes or errors creep in – they can alter the DNA and in turn potentially change what a cell does and how it behaves. More often than not these mistakes – also called mutations – are spotted and fixed using cellular DNA repair processes. But sometimes, they aren’t fixed. If this happens, and a mistake stays in a cell’s DNA, mutations are classified as one of two types – those that don’t cause harm and those that do. There’s no need to worry about mistakes that don’t cause harm. Called ‘nonsense mutations’ these mistakes can sit in the cells’ DNA and not affect how it works. But mutations that do cause harm can cause a whole range of diseases – including cancer. Mutations – cancer causing or otherwise – come in many forms. They can be a single change in one letter in the DNA code. Or they can be deletions, or duplications of whole sections of DNA. And they come about in different ways. Mutations can arise because of normal cellular ‘wear and tear’ or happen when a cell is making a copy of itself. In particular, cancer causing mutations can be caused by exposure to carcinogens, chemicals like those found in tobacco smoke, and asbestos which are known to cause cancer. Cancer causing mutations can also be inherited, meaning these genetic mistakes are passed on from one generation to the next. Most mutations develop over a dog’s lifetime, and it’s very rare for one single mutation to cause cancer. Instead, a number of mutations need to be present at the same time in the same cell for a cancer cell to develop. Cancer causing mutations all work in different ways. But there are certain criteria a cell needs to meet in order to be called a cancer cell. Cancer cells are just as clever as healthy cells. And all of them share a number of characteristics not seen in healthy cells, that allow them to survive against the odds. Unlike healthy cells, cancer cells don’t stop dividing when there are enough of them there. This means that they continue to divide out of control, making more and more copies of themselves until they eventually form a tumour. This ability to divide out of control is helped by the fact that cancer cells develop ways to avoid signals telling them to ‘self-destruct’ or die, and to avoid any signals that tell them to stop growing. And at the same time as avoiding ‘stop growing’ signals, cancer cells also have the ability to grow without any signal or stimulus to do so. Cancer cells ability to make their own blood supply (angiogenesis) is another trait that helps them flourish. By being able to make their own blood vessels and develop their own bloody supply, cancer cells and the tumours they form can get the food and oxygen they need to continue growing. Another characteristic of cancer cells is their ability to move and spread around the body (metastasis). The cells can travel to other parts of the body where, to begin with at least, they will have more food and energy sources, as well as more space to grow and form another tumour. This characteristic in particular brings a host of problems when it comes to treating cancer because when a cancer spreads it becomes much more difficult to treat. Scientists are learning that cancer cells can and do pick up new mutations as they divide that help them continue to grow and survive. They’re also learning that by changing and reprogramming how it uses energy, a cancer cell can continue to grow and divide even when energy and fuel sources are in short supply. One of the most exciting advances in cancer research over the last decade has been the increased understanding of the role the immune system plays in the disease. 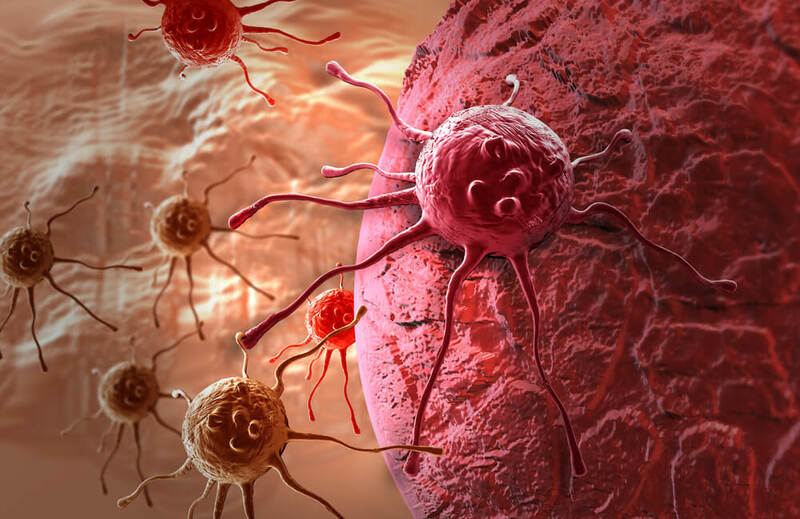 It is now known that cancer cells can hide from the immune system. This means that the immune system doesn’t recognise a cancer cell as something that shouldn’t be there, and so leaves it alone. It’s also now well established that through a series of complex signals and interactions cancer cells can ‘trick’ cells of the immune system into helping them grow and thrive. These last two advances in understanding in particular have led to the development of treatments that are directed towards the immune system to either help it recognise cancer cells, or to help it kill them. Advances in science over the last 50 years or so mean that we now know more than ever before about the disease. We know that healthy cells become cancer cells because they develop mutations in their DNA. And we understand more than ever how these cancer causing mutations arise – and perhaps more importantly that some of them can be prevented. We also know that cancer cells have a whole range of characteristics that help them grow and survive against the odds. Armed with this knowledge, scientists can continue to not only learn about the disease but also how to best treat it.